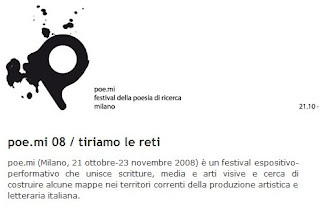 poe.mi (milan, oct 21st - nov 23rd, 2008) is an exhibition and performing festival that brings writing, media and visual arts together, trying to draw some maps in the territories of artistic and literary production today in italy. in this first edition, “tiriamo le reti” (let’s pull the nets up), poe.mi focuses on the world wide web, and especially on blogs, as new leading channel for much of the new italian poetry -- in some cases directly in touch with other foreign poets as well as in relation with other kinds of arts, and often with results and qualitative experiences that can easily be compared with traditional paper publishing. blogs, soon after a few years they first appeared on the internet, seem to have become a very lively context and a contact point for different poetics and literary identities that, not long ago, were very far from each other and in need of a continuous mediation. at the same time, they appear to be the natural environment of literary production that uses the new dimensions and modalities offered by the net. poe.mi takes place in three different locations in milan, each one dedicated to a specific aspect of the festival: AR.RI.VI (archivio ricerca visiva, via botticelli 8); casa della poesia (palazzina liberty, largo marinai d’italia); il punto rosso (via guglielmo pepe 14). Dario Bellini, Giuliano Guatta, Matias Guerra, Bruno Muzzolini, Marco Vaglieri, Marco Formento / Ivano Sossella. Annelisa Addolorato, Yuri Ancarani, Gherardo Bortolotti, Roberto Cavallera, Antonio Diavoli, Filippo La Vaccara, Antonio Loreto, Alberto Mori, Michele Zaffarano. Gherardo Bortolotti, Anne Boyer, Biagio Cepollaro, David-Baptiste Chirot, Michelle Detorie, Linh Dinh, Brandon Downing, Clifford Duffy, Marco Giovenale, Jim Leftwich & John Crouse, Filippo Minelli, Matina L. Stamatakis, Michele Zaffarano. Aurelio Andrighetto, Dario Bellini, Gherardo Bortolotti, Alessandro Broggi, Franco Buffoni, Gianluca Codeghini, Jacopo Galimberti, Paolo Giovannetti, Marco Giovenale, Elio Grazioli, Luigi Grazioli, Andrea Inglese, Helena Janeczek, Andrea Raos, Jan Reister, Stefano Salvi, Vanni Santoni, Italo Testa, Maria Luisa Venuta, Michele Zaffarano. I like you list of participant...their blogs are great.